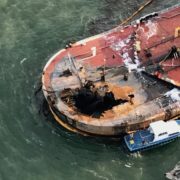 Around 4:30 am on October 20, a barge filled with nearly 5-½ million gallons of crude oil exploded off the coast of Port Aransas, Texas. Two crewmen lost their lives, and although the cargo holds reportedly were not breached, the crippled vessel began leaking oil into the Gulf. The U.S. Coast Guard reported a spill roughly two miles long and a quarter mile wide, and response crews were seen setting up oil booms by late afternoon. By the end of the weekend, more than 6,000 feet of containment booms had been placed to protect essential habitat areas along Mustang and North Padre islands. 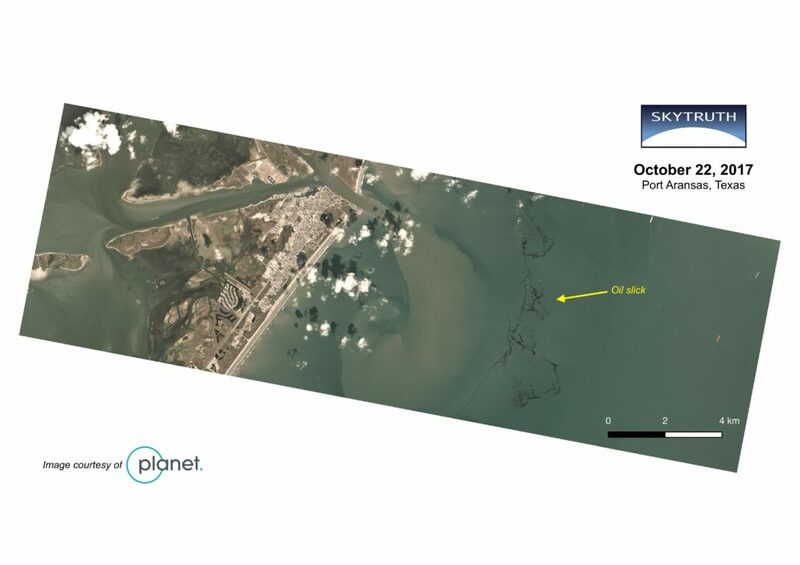 Satellite imagery from Planet shows the spill at a resolution of three meters, just two days after the explosion. The spill spread out off Port Aransas and started drifting slowly south toward Mustang Island State Park and Padre Island National Seashore – critical wintering habitat for migratory birds including the red knot and the piping plover, both listed as threatened under the U.S. Endangered Species Act. The Coast Guard issued a news release late on October 25 indicating the barge had been moved to shore. Beach cleanup teams continued to work on Mustang and North Padre islands, where more than 70 cubic yards of “oily solids” have been removed. Some shorebirds have been seen with oil on them, but wildlife teams have had difficulty catching and cleaning any of them. If oiled wildlife is rescued, they’re likely to go to the University of Texas Marine Science Institute’s Amos Rehabilitation Keep (ARK) for treatment. 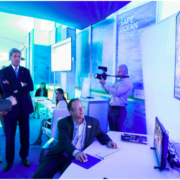 Together with partners from around the world, SkyTruth uses the view from space to motivate people to protect the environment. SkyTruth is committed to transparency in all things. In the spirit of that, we wanted to share our annual report with you which covers the impact we’ve been able to have as a watchdog, innovator, and motivator for environmental good. oil and gas operators reported crude oil, gasoline, saltwater and other contaminants spilled from wells, pipelines and storage tanks into coastal or inland water totaling 568,000 gallons. 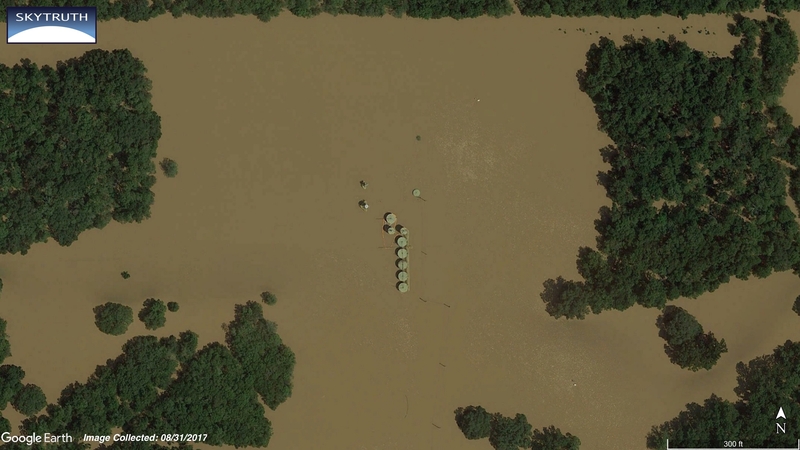 The images below show some examples we found that reveal flooded oil and gas infrastructure in the impacted area. 1. 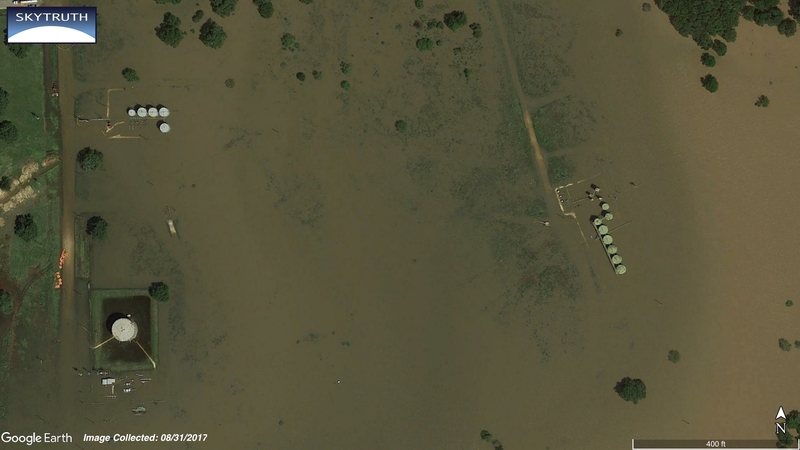 PlanetScope imagery shows flooded oil and gas infrastructure along US-90 between Denvers and Nome. It is unclear whether the large rectangular pond in the upper left corner of the imagery is connected to the nearby drilling infrastructure. A small pond at 30°01’36.7″N 94°30’07.5″W adjacent to a well pad doesn’t appear to have a liner, and may be a stormwater runoff impoundment. View a larger version of the slider here. This image shows a zoomed-in view of the oil and gas infrastructure from the previous slider, with the location of possible stormwater runoff impoundment identified. 2. 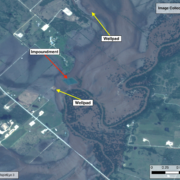 Imagery from Planet’s RapidEye 3 satellite shows a flooded well pad and fluid impoundment along the Guadalupe River near Hochheim. View a larger version of the slider here. 3. 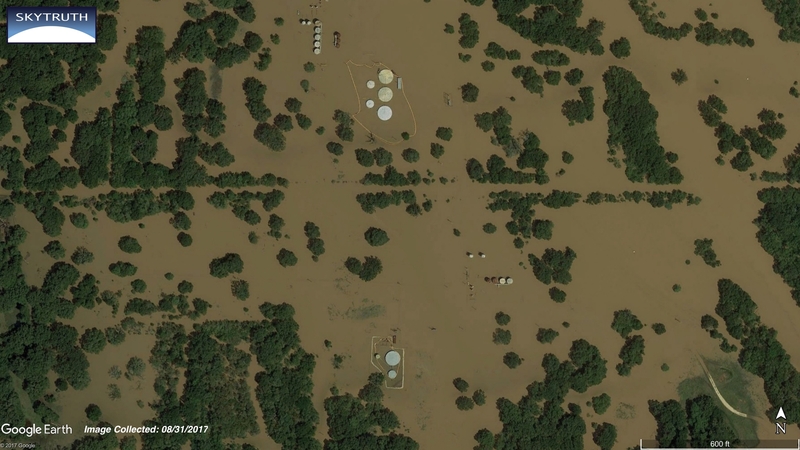 PlanetScope imagery shows flooded oil & gas infrastructure between Smithers Lake and the Brazos River southwest of Houston. View a larger version of the slider here. 4. 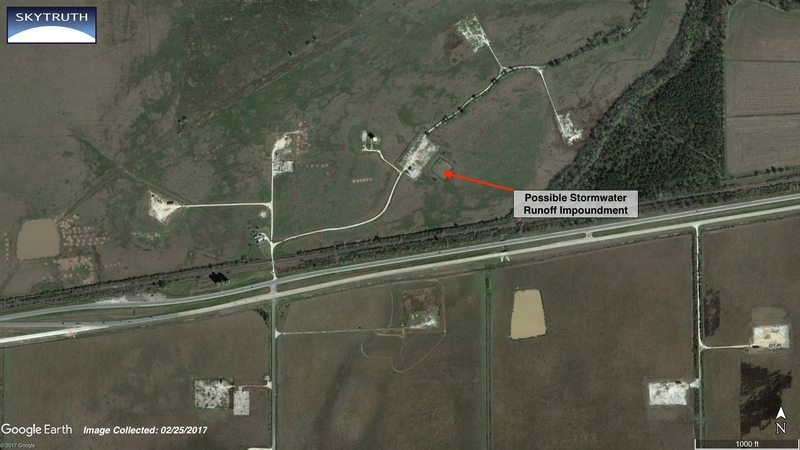 Imagery from Planet’s RapidEye 2 and RapidEye 5 satellites shows flooded petrochemical storage tanks in Galena Park operated by Magellan Midstream Partners. According to a National Response Center report, close to half a million gallons of “gasoline type product” were discharged at this site. View a larger version of the slider here. We see fewer large oil spills compared with the aftermath of hurricanes Katrina and Rita in 2005, where operators reported more than 9 million gallons of oil spilled from storm-damaged oil storage tanks and offshore platforms and pipelines. We’re continuing to see major air pollution impacts from storm-impacted refineries and other chemical plants, some surrounded by densely populated residential areas; and inland and coastal flooding submerging drilling sites and drilling-related fluid impoundments, toppling unsecured tanks and adding a wide range of chemicals to the floodwaters inundating people’s homes, schools and businesses. As sea level steadily rises, and the warming atmosphere subjects some areas to stronger storms and heavier rainfall events, these problems are likely to get worse. Moving oil and gas infrastructure out of high-risk flood zones would seem to be a common sense action to mitigate at least some of this threat.